Lycoris squamigera, Resurrection lily in bloom. In late July through early August, the Shade Garden at Bon Air Park features a floral display that is short-lived but spectacular nonetheless. 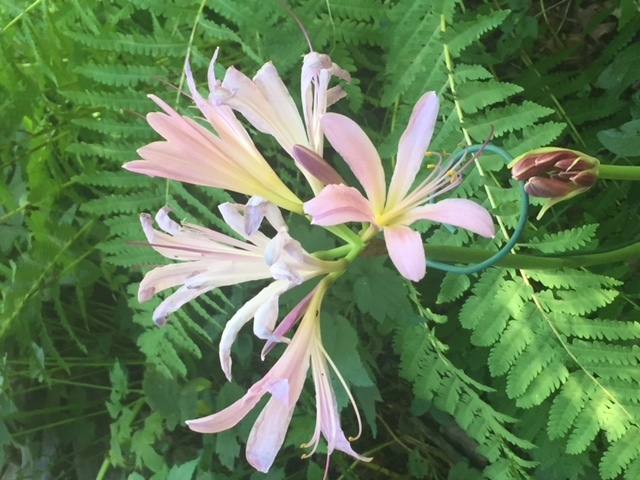 The plant, Lycoris squamigera, also known as surprise lily, resurrection lily or naked ladies, makes two very different appearances during the growing season. Its first entrance in the spring consists of long, strap-like leaves, which last for several weeks. After the leaves die back, there is no further trace of the plant until leafless 1.5-2 ft. stalks rise from the soil a few months later, ready to offer trumpet-like flowers in light shades of pink. This bulb is in the amaryllis family, grows well in full sun to part-shade, and naturalizes by creating bulb offsets. It is easy to maintain, requiring only mulch in the winter and moderate amounts of water after the leaves die back. It can be found in zone 1E of the Garden. In addition to this blooming beauty, the Garden has another plant whose flowers are on display. Phlox paniculata or garden phlox is one of four native species of phlox in the Garden’s collection. This species grows to about 3 feet in height and comes in a range of saturated colors—pink, purple, lavender, white, and red. Garden phlox’s blooming period lasts several weeks which makes it a nice, colorful addition to any local garden. The genus name Phlox derives from the Greek word for flame, a fitting moniker given the brilliance of its colors. Garden visitors can enjoy the pink and white varieties in the Shade Garden. 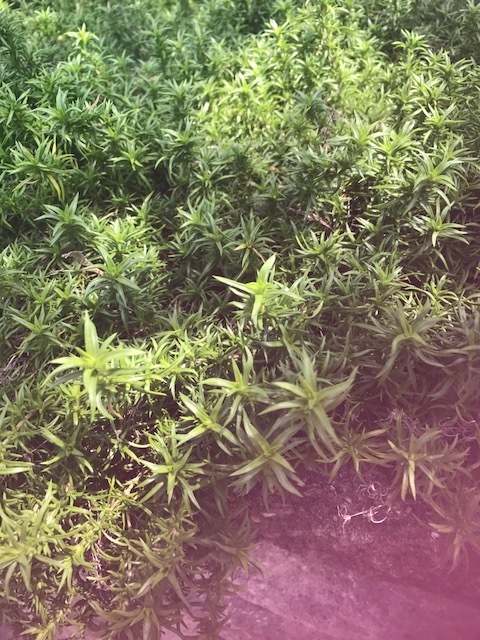 Garden phlox is susceptible to powdery mildew, a fungal disease that is almost never fatal but can blanket the leaves with a fine white powder. To mitigate this problem, it is important to allow enough air circulation between the stems. Pruning a few to the ground can do the trick or dividing large clumps in the spring into smaller clusters can also help. Another strategy is to use mildew-resistant cultivars. Unlike garden phlox with its taller blooms, the remaining three phloxes are considered groundcovers. The first to bloom is Phlox subulata or moss phlox. It too comes in a variety of colors—when blooming it can be seen in masses of white, pink, lavender, blue, purple or red flowers. In our area one often sees the bright pink or lavender varieties blanketing garden borders or spilling over garden walls. This plant can grow up to 6 inches in height with a 24-inch spread. In Latin, subulata means awl-shaped, a reference to the very slender leaves that taper to a point (see image). In winter, the leaves usually retain their color. Though it prefers full sun, it does well in areas that are partly shaded. 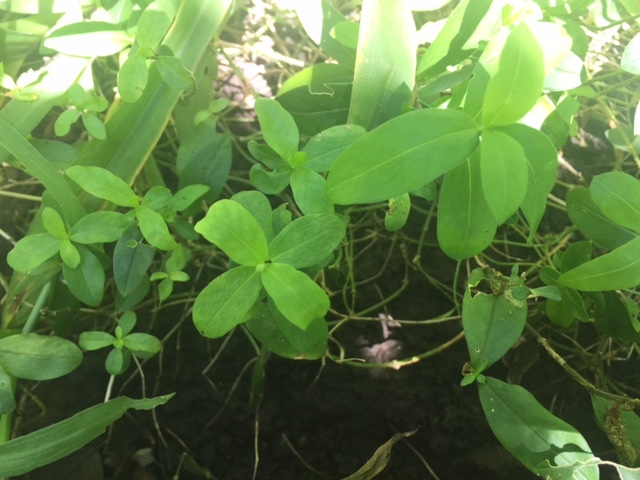 This plant is located in zones 4E and 4W of the Garden, which do enjoy some afternoon sun. Powdery mildew does not seem to affect this species to the same extent as the other species and it may tolerate rabbits better than the other three species as well. Phlox divaricata or woodland phlox is an herbaceous perennial that can reach up to a foot in height with a similar spread. This species of phlox can be found in zones 1W and 2W of the Garden. In the wild, as its name suggests, it can be found in wooded areas, fields, and near streams. It blooms in April and May in shades of lavender, pink, violet, or blue. Flowers grow on stems reaching 12 to 15 inches in height. It is deer-resistant and drought-tolerant – a significant advantage in our northern Virginia area, though rabbits can pose a problem. It can also be affected by powdery mildew and spider mites. Cutting back spent flowers can help address powdery mildew. The fourth and final species of phlox in the garden is Phlox stolonifera or creeping phlox. It can be found in zones 1C, 1W, and 2W of the Garden. Its flowers come in light blue, pink, violet or white. This species tolerates drought, rabbits and deer – three big challenges Northern Virginia gardens can face. It grows well in full sun and can tolerate a good amount of shade. Flowers bloom on 8-inch stems that hover over a 3-inch leafy bed. Creeping phlox, as its name suggests, can stretch indefinitely – making it a good groundcover for larger spaces. It too can be affected by powdery mildew. Thinning the plant, or removing severely affected areas and the proper disposal of removed plant material (placement in the trash) can minimize the survival of the fungus both during the growing season and in winter months. Though water on the leaves may wash off spores, it is important to water in early to mid-morning (as opposed to evening watering) so that leaves do not remain damp for long, which could create a hospitable environment for other pathogens. The popularity of phlox as a garden plant is attested to by its selection as “Perennial of the Year” by the Perennial Plant Association. In 1990, the first plant to receive this award was Phlox stolonifera. In 2002, the white mildew-resistant cultivar Phlox paniculata ‘David’ received the honor. Any of the native phlox species featured in the Shade Garden would make a colorful and environmentally friendly addition to northern Virginia gardens. 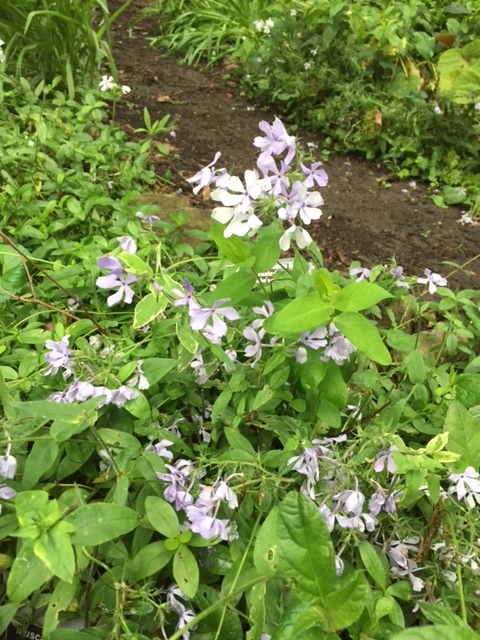 This entry was posted in Shade Garden and tagged Fall Phlox, Garden Phlox, Lycoris squamigera, Phlox divaricata, Phlox paniculata, Phlox subulata, Powdery Mildew, Quarry Shade Garden, Woodland Phlox. Bookmark the permalink.